I focus on traffic accidents. So I searched about the most common traffic accidents through internet and some people around me, and researched how I can solve those problems with electricity. In my group, I think it was nice, because he thought an idea about traffic accidents for this project, and he told me he researched about that. But he was too sick to come school for a few weeks and I didn’t know the reason but he didn’t deliver them to me, so I had to do this presentation almost on my own. But, he didn’t think about this topic, it was impossible to get good works. It wasn’t perfect but I liked to give a presentation on my own. I could learn about to find the problems in our lives, and how we can research about that. 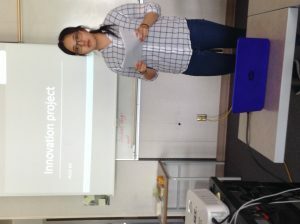 how I can share the information and prepare presentation with people.